Before the discussion turns to the actual network hardware, there maybe a need to determine what network adapter can be installed in a particular machine. Three types of card types are available, ISA, EISA and PCI. Almost all modern Intel PCs will have PCI and EISA slots, whereas older machines may have just ISA or ISA and PCI. Pictured below is the expansion card carrier from this actual PC. It is removable from the machine (yes, I turned it off first! ), and is really quite good for displaying the differences between the different slots. 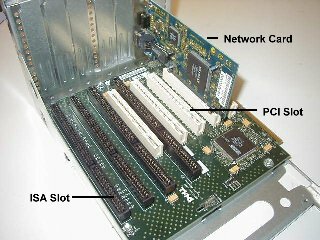 This machine has EISA and PCI slots, and has just the one slot used for the network card. Notice that the two sets of slots seem to interleave? The two middle slots are either PCI or EISA, both cannot be used at the same time, so this PC can only have a maximum of six additional cards installed. 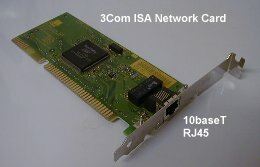 Very common 3Com ISA Ethernet adapter that supports only RJ45 type ethernets. It is also 10M HD speed. This type of card is quite readily picked up second hand at computer fairs, tho' beware they will be second-hand. 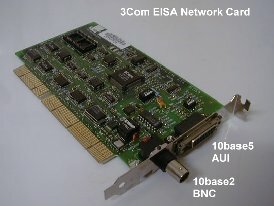 3Com EISA 10M card supporting just 10base2 and 10base5 interfaces, which, to be fair are not much use in the modern networked home, the latter especially;-) It is highly unlikely to be used in the home networking environment as it is very cumbersome. 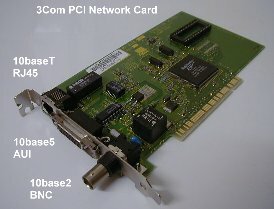 A 3Com PCI card that can be used on practically all ethernet types, albeit at 10M only. This card, like the others, may look a bit on the ancient side compared to the nice Netgear card in the chassis above, but all three work happily in Win9X, NT, Linux and Solaris for Intel, tho' you may need to download the relevant drivers from 3Com, or switch off the plug and play feature if the card features it and the OS requires it (Linux, definately). They all work with BSD variants as well. NICs dicussed thus far have been for use in full-sized PCs. If a laptop needs to be networked then a PCMCIA Ethernet Card is needed. PCMCIA cards are roughly the size of credit cards, only thicker. The card slots into one of the PCMCIA slots on the laptop and usually has a strange cable. with a network interface, that plugs into the viewable end of the card. Some network adapters are easily recognized, with either a manufacturer's logo or a product name imprinted on the card. Sometimes, however, a card can be purloined that cannot be identified so easily. In these circumstances, there are two ways of identifying an unknown NIC. The first is by using it's MAC, or Hardware, address and the second is by an FCC number, or ID. Most, if not all, networking components have a hardware address associated with them. This is also known as a MAC address and each MAC address is unique. This uniqueness is due to the way MAC addresses are divided amongst manufacturers. MAC address assignments are made by the IEEE and manufacturers apply to the IEEE for OUI (Organizationally Unique Identifier) allocations. The OUI forms the first 6 digits of a MAC address. The manufacturer is then free to use the remaining 6 digits in their preferred way. For example, the MAC address 00-04-E2-07-23-90 identifies a particular NIC as being made by SMC. As well as applying to the IEEE for an OUI for their hardware, a manufacturer must also apply for a license from the FCC (Federal Communications Commission). This license declares the hardware's conformance with the FCC regulations as regards communications equipment in the form of a 3 digit 'Grantee' Code. This Grantee code identifies the licensee. For example, the Grantee code DF6 identifies 3Com as the licensee. The remainder of the FCC code is the manufacturer model number, which can be very useful. Once you have the manufacturer, it is then usually just a matter of visitng their web site in order to obtain the drivers for the device, although sometimes this is not always that straight forward, especially where indentification is made by MAC address only!